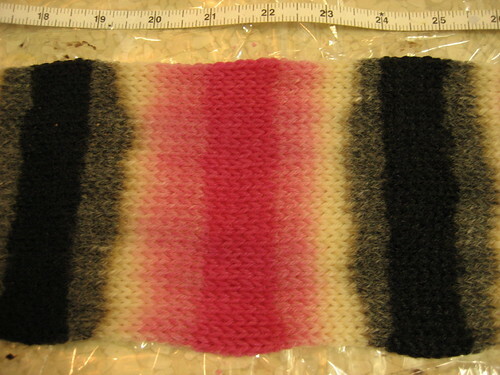 Thing 1: I used more pink than calculated (9 mL instead of 6) because it didn't look as dark as I would have liked. Of course, it migrated a good bit, so that accounts for the larger pink sections. 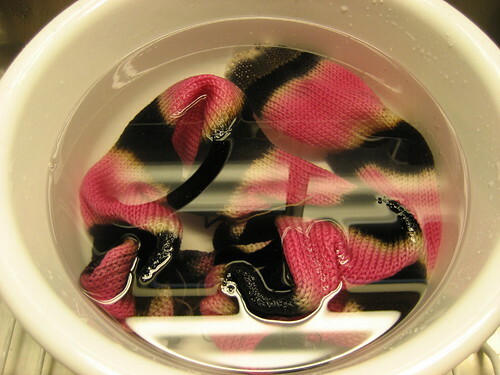 Because of the way the first batch dyed, there aren't grey and light pink sections, so much as black and pink separated by the littlest bit of white and off-whites. 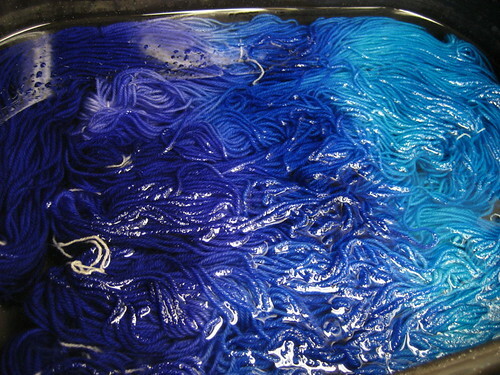 As I mentioned yesterday, the dye migrated quite a bit. The initial black stripe was skooshed within the 1" section, but migrated about half an inch beyond that. When I added the "grey" dye (diluted black), there was already so much black that it just made the slightly fainter black more black. Same with the pinks. Goals 1 and 2: I wanted to eliminate as much of the black drool as possible, and get a little more definition in the greys and light pink, as well as white sections. 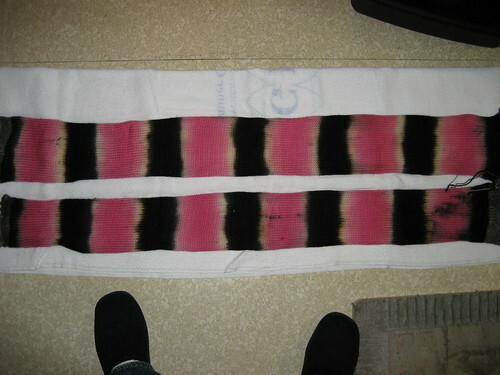 Also, this meant there was a LOT less liquid on the blanks so that meant less liquid to carry the black dyes around. This decreased the black drool considerably. 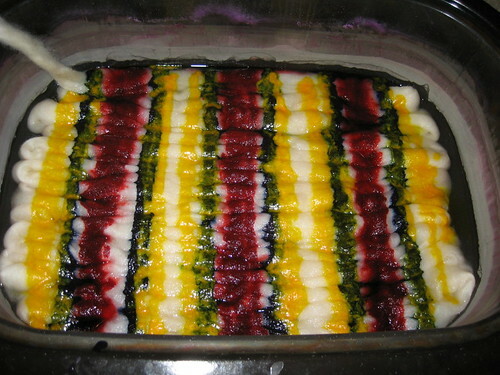 It also meant less dye, which meant less migration and more distinct white areas post-nuking. Excellent. Thing 2: I also remembered to spritz the vinegar BEFORE nuking. This meant not having to unwrap and possibly contaminate the non-black sections. 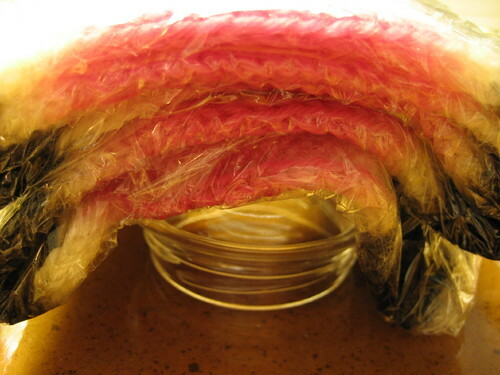 Thing 3: I carefully folded up the packet accordian style with black at the edges and put a small glass jar under the pink section to keep it elevated. I figured any black dye that wanted to roam would stick to the lowered areas and stay away from the pinks. I think this helped. Thing 4: I had to nuke for smaller amounts of time because, as the temperature went up, the packet started inflating and falling over. I nuked until it was about to fall over, and then let it cool a bit before repeating. I think I had 4 nukes instead of the usual 3, so this wasn't too bad. 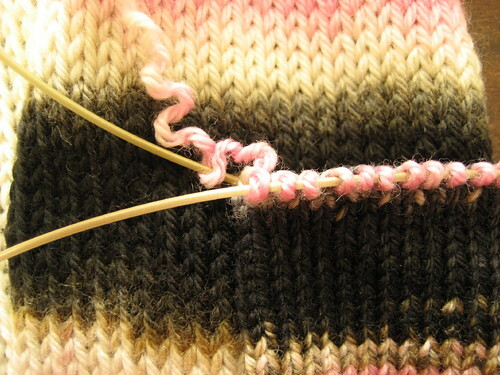 I think, no matter how you look at it, making self-striping yarns is time-consuming. 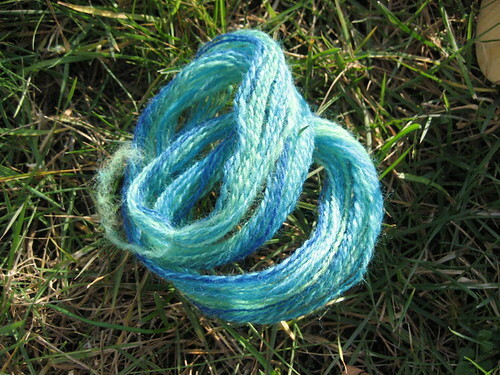 I think this method means a lot less winding for self-striping yarn. That's a definite plus. No walking around chairs or keeping track of peg boards. 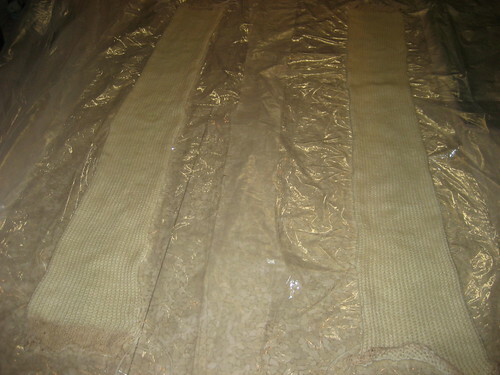 I think if you know how to use your knitting machine, it's not bad making up the blanks. If you don't, you may curse or sweat. 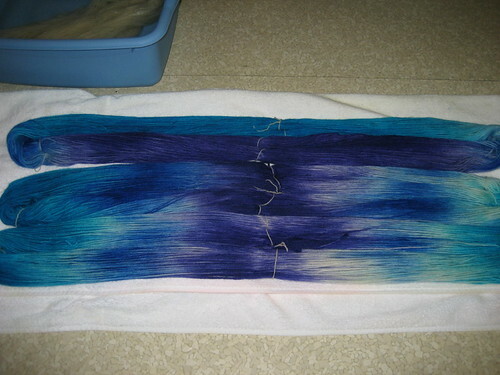 I think applying the dyes is not difficult but probably less mindless than the usual ways. I think the mottled and unpredictable transitions between stripes is very interesting and fun to watch. 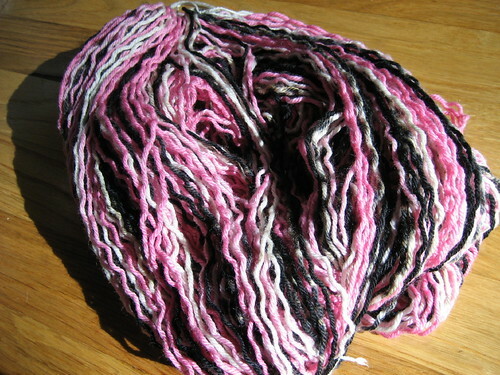 I think carrying around a dyed blank is less fiddly than a skein of yarn: no tangles or knots. 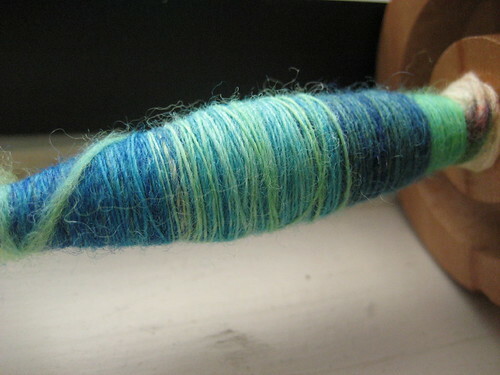 I think intentional frogging of dyed blanks as you're knitting up socks is fun and satisfying. Frogging is not fun when it's endless, when it's because of a mistake you made, or when it means you're negating hours of work. None of these apply! I think I'm done with self-striping socks for a while. 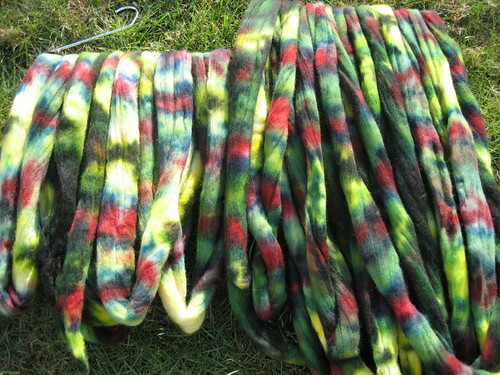 My Dye-O-Rama yarn is finally dyed and dried and ready to go out! Wanna see? A light steaming and a bath did not entirely remove the crinklies, but I don't think it'll be an issue in the knitted item. I wonder if the cooking or the cooking and drying in knitted form made the crinklies so pronounced. This time 'round I made several changes in hopes of having clearer color bands. Overall, the changes worked great. But first things first... How I did it the first time. 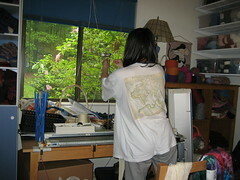 It's a Studio SK860, I think, bought new several years ago. Suffice it to say, I had grand plans. Scott took them, despite protestations of unwashed hair and grubby clothes. 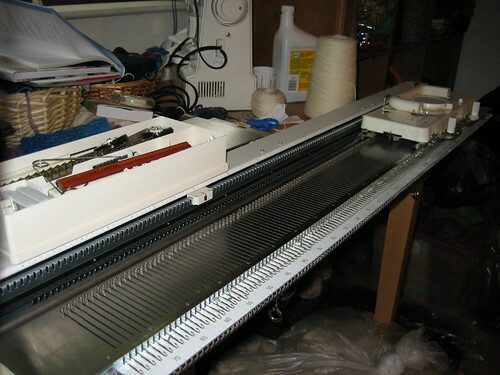 This machine knits primarily dk to light worsted weight yarns. I'm no machine knitter so don't hold me to that. But that's a rough range. 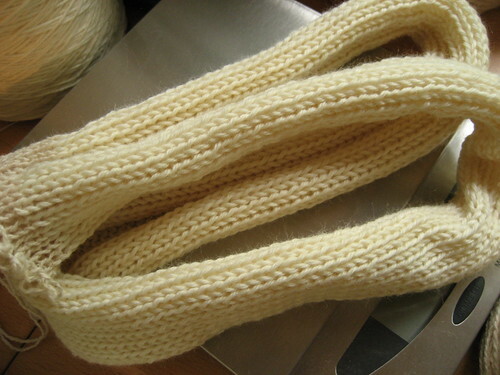 I "cast on" with grippy waste cotton over 30 needles at dial setting 6 and knit about 8-10 rows. 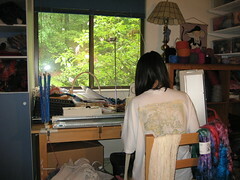 Then I switched to the Kona superwash and knit 200 rows (I weighed as I went; 200 rows = 2 oz). Back to the grippy waste cotton for another 8-10 rows and then off the bed. 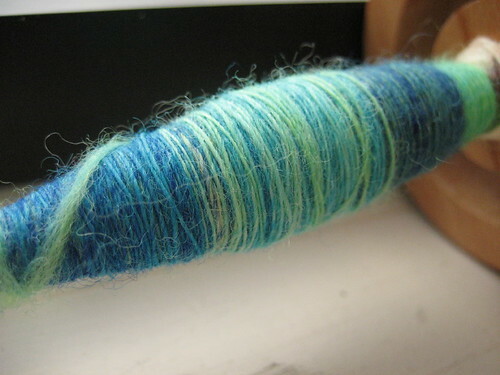 Rinse and repeat for the second skein. Note: this made a very loose fabric, which worked out fine. 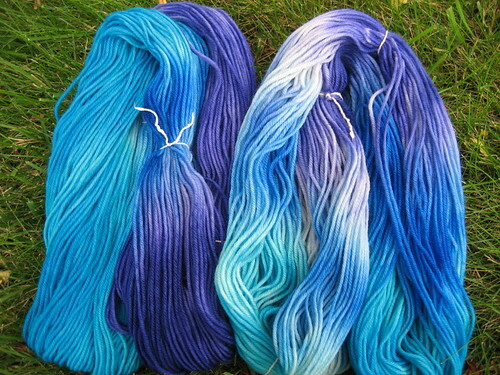 The yarn fulls when washed and dyed, and you don't want a tight gauge getting in the way of dye penetration. 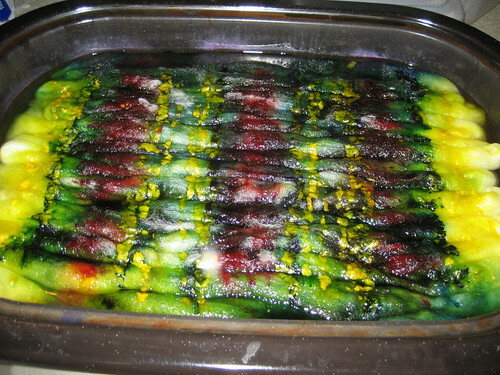 I soaked the blanks in hot water with a bit of dish detergent and rinsed gently before using. 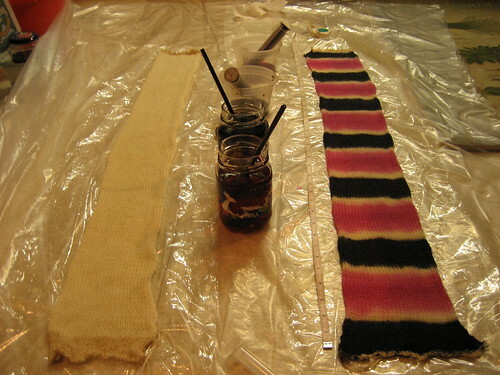 When ready, I laid out my protective plastic drop cloth and plastic wrap and unrolled the blanks onto the plastic wrap (stockinette stitch, as you know, wants to curl up something fierce, so I did my best to lay it flat). 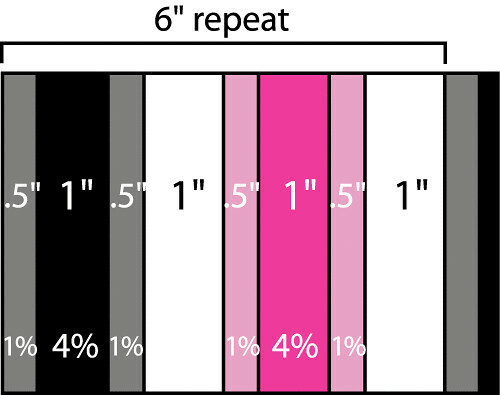 I based my numbers on Deb Menz's Color in Spinning, past experience and guesstimation. Good old guesstimation. Here's how it went. 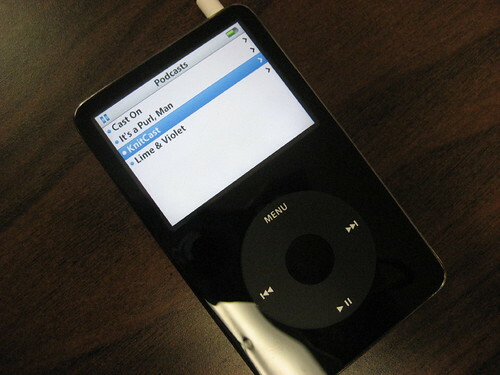 (If you really hate numbers and would rather skip to the fun part, jump to the Aside). To figure out how much dye to use, first I figured out what dye intensities I wanted. I knew I'd get good saturated colors with 4% dye solution, and then I figured 1% ought to do it for the greys and light pinks. Next, I figured out what percent of the whole each band was. The total was 6", so each (non-white) color was 2/12 of the whole. Here's where it gets a little interesting. If you like math. If not, maybe the opposite. because the black takes up only 2/12 of the whole. Right. And for the 1% bands, I decided to dilute the 1% dye solution to .25%, so that the calculations would be the same as above. 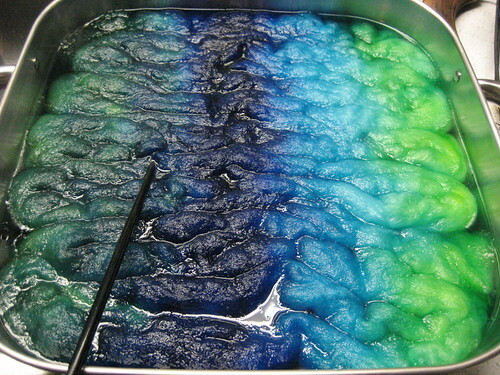 Same amount of liquid, different amount of dye. To be honest, you can just wing it and put as much as looks right to you. If you want consistent stripes, then use the same amount for each stripe. It's that easy. I laid out measuring tape next to my blank. 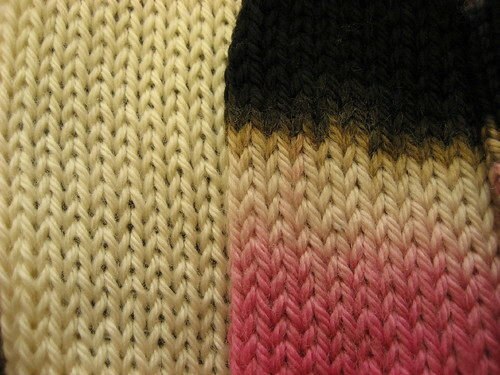 Following the color pattern, I added the dye and skooshed in to make sure it got all the way through to the other side. 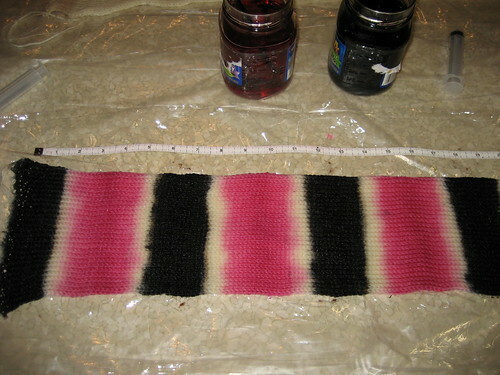 I started with black and did all the black stripes, then did the pink stripes, then the lighter colors. 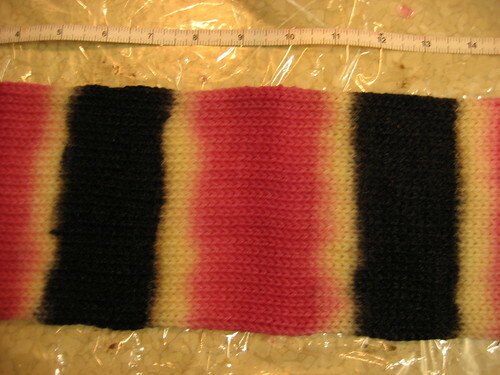 Above, the black bands were placed and skooshed between the 6" and 7" marks, and 12" and 13" marks. The grey was placed over the migrated black sections. I used more pink than calculated because I wasn't happy with the intensity. Hence, it migrated more. I spritzed a nice layer of vinegar over the whole shebang. After nuking and forgetting. Doh! Nuked for the usual [~2 mins on, several mins off] x 3. You can tell there is much less white here than before nuking. Also, there are a bunch of areas where the black drooled, plus one section where I accidentally spattered black... I wasn't quite happy with how it turned out so I made a bunch of modifications and tried again. That's the photo at the beginning of the post! Details on that coming up. Thanks so much for your words and thoughts. Just. Thank you. 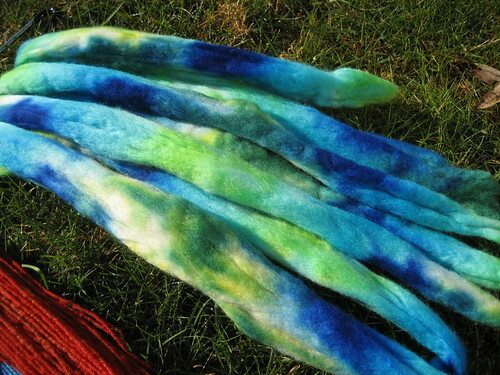 This week I'm at a technical conference in Boston so posts will be spotty, but I've been dyeing and it's been fun so I hope I can squeeze something in here and there. 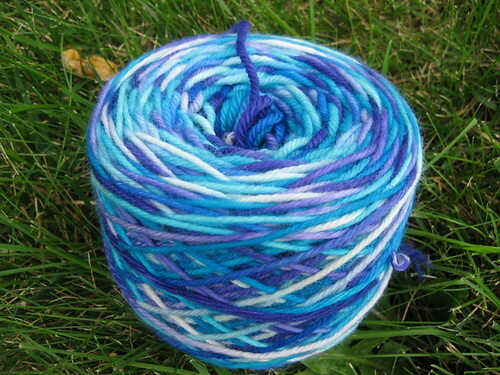 It's about time I got started on my Dye-O-Rama sock yarn! 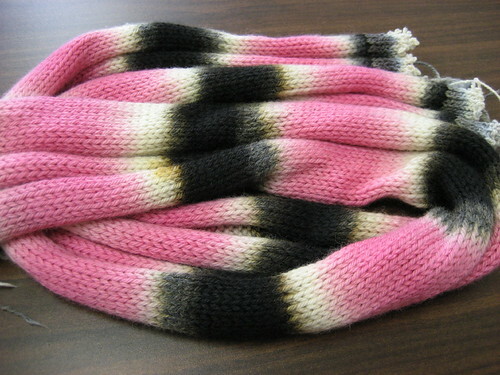 I knitted up some Kona on the knitting machine and then dyed stripes of pink, black and white. 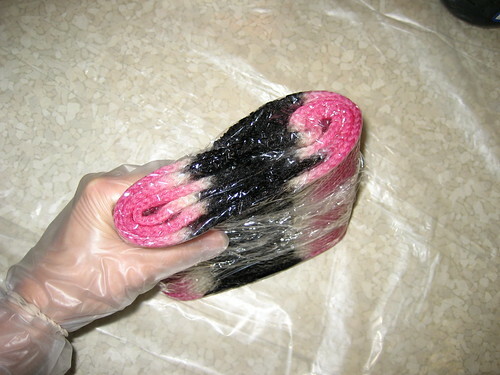 The results were a little unexpected with some bleeding of black dulling the pink, a few black splotches, and a lot less white than expected from dye migration. But, overall, I got the effect I was looking for, so with a few tweaks I think it will suit my purposes. I'll post more details on the whats and the hows soon (you know me, there were plenty of calculations flying around, some useful, some not so much).